It's Monday my friends and I'm feeling pretty Marvelous!!! I had an incredible weekend with friends and my little family, so I would say that's the perfect way to start this week off on the right foot! Also, I have an incredible giveaway to share with you all today along with a super easy, delicious and healthy recipe for an oven baked pancake. You can't beat that, right?! Alright, let's be honest, life is busy. I feel like we are constantly on the go around here these days. I know we aren't the only ones, so lately, when I think about developing recipes, my first consideration is to come up with something everyone can do quickly and easily. I got to thinking about all the meals that are a little on the time consuming side and came up with pancakes as being one that we love, but I always dread the time I spend in the kitchen flipping them. I don't know about you, but when the weekends roll around, I just want to relax, drink my morning coffee slowly (instead of slamming it down my throat while driving) and watch home shows with my husband. Well, my kids have a different picture of what the weekend mornings should look like. They like to have a "Saturday" or "Sunday" breakfast, as they call it, which is completely different from any other day of the week kind of breakfast (you know like cereal or yogurt). I get it, the weekends mean big breakfasts with all the fixings! I love cooking, it's what I was meant to do, it's my zen, but with how busy things have been lately, I am really focusing on coming up with fast, healthy, simple recipes that don't actually taste like they are all of those things. So, this is when I had the idea for a baked breakfast pancake. This recipe is so simple. 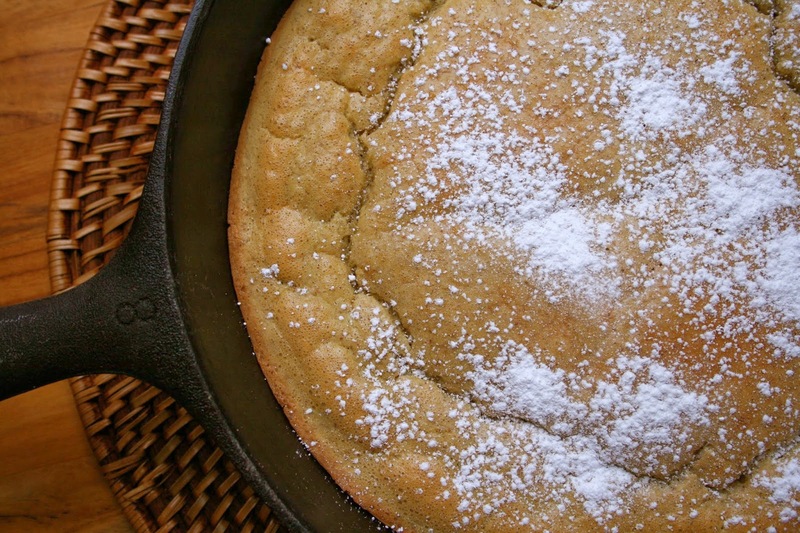 You just put everything in the blender, blend it all up, pour it into the pan and bake it! No standing in the kitchen for 30 minutes flipping pancakes! The topping options are endless. 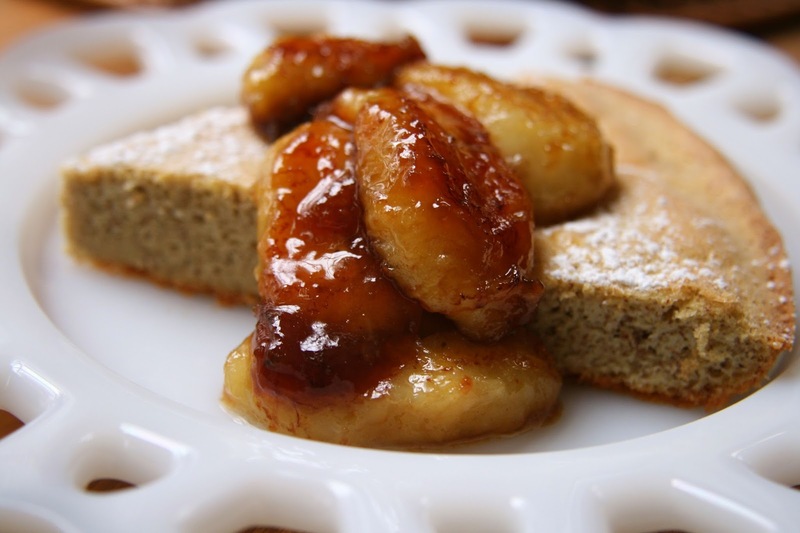 I topped ours with powdered sugar and caramelized bananas*. Strawberries and whipped cream would be amazing too. I'm definitely making this the next time we have company over for breakfast. A build your own topping bar would be perfect with this easy to make pancake. The boys enjoyed this so much, they went right back in for seconds! That makes me a happy mama. They don't even know this was good for them. Sssshhhh, don't tell them! Heat the oven to 425°. 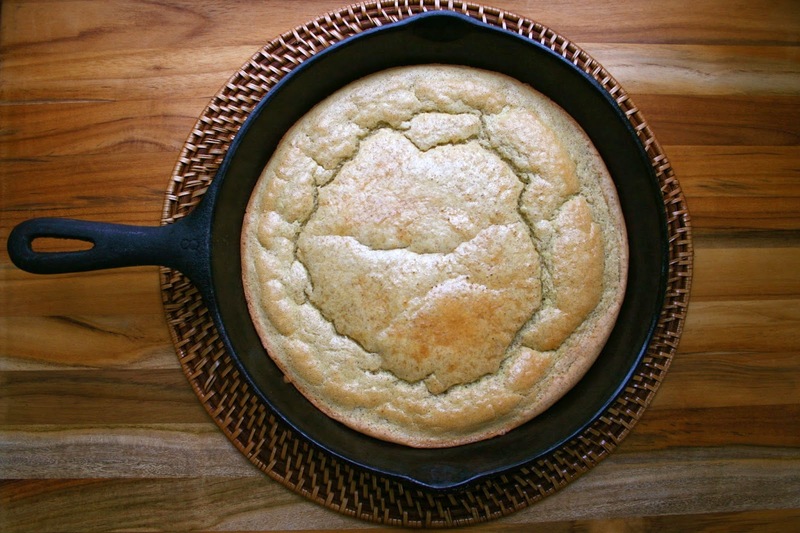 Place the coconut oil in a 10" cast iron skillet. Melt the coconut oil in the oven while it preheats. Place the hazelnut meal through lemon juice in a blender and blend 2 minutes or until completely mixed together on high speed. Swirl the melted coconut oil in the pan to completely coat it. Pour the pancake batter into the pan and bake for 20-25 minutes or until slightly browned on top. Serve warm with your favorite pancake toppings. 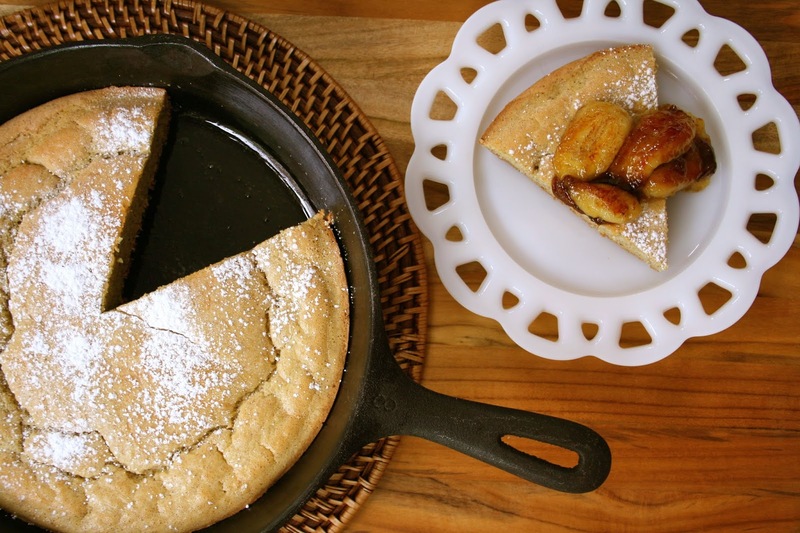 *To make the caramelized bananas, I simply melted non-dairy butter in a skillet, sliced the bananas, cooked them slightly and then added a little brown sugar and vanilla to them when they were just about done cooking. How would you like to try out the new Hazelnut Meal from Bob's Red Mill and receive a $50 gift certificate to try out more of their amazing products? Well, here's your chance! You have multiple ways to enter. Make sure you leave a comment for each entry. Winner will be announced Tuesday, April 8th. Good Luck! 2. Follow me on Facebook. 5. Follow Bob's Red Mill on Facebook. 6. Follow Bob's Red Mill on Twitter. I Like pasta with a side of salad for quick meal. I Follow Bob's Red Mill on Twitter. My favourite quick meal is socca and salad. I liked Bob's Red Mill on facebook. My favorite quick meal is a green smoothie with some ground up oatmeal and coconut oil. Oh this looks incredible. Just pinned it. I love Bob's Red Mill products too. I guess one of my fast or at least easy meals is baked sweet potato fries and one of my homemade veggie burgers. Favorite quick meal is an omelet baked in my smaller casserole dish. So a baked egg dish! My favorite quick meal is a turkey burger and Brussels sprouts roasted in bacon pieces. My favorite quick meal is oatmeal/oat bran! It is easy, quick, comforting, and can be made either savory or sweet depending on what I am craving! Whether it is savory topped with butter and a fried egg or sweet topped with cinnamon and nut butters... I just love oats! I like Bob's red mill on facebook! I also follow Bob's red mill on twitter! Favorite quick meal would have to be an egg and veggie scramble! Hummus-crusted chicken is a super fast, healthy recipe...Diced veggies, some olive oil, chicken breast, hummus, lemon juice, and paprika baked in one dish for 40-50 minutes. So easy and tasty! I'm so glad you had a great weekend with friends and family. Sometimes those can really recharge our batteries. As for your giveaway, my favorite quick meal is probably eggs, fried or scrambled. I already follow you on Instagram and now I'm following you on Facebook. For some reason, I didn't realize you had a FB page, so I wouldn't have Liked it with or without the giveaway. I also Liked Bob's Red Mills on FB which I would have also done anyway since I'm a fan of their product line. I use their pancake mixes and the Hubby's loves their breakfast combos. Frittatas! Eggs, veggies, +/- meat, spices. Delicious. Easy. Quick! My favorite quick meal is avocado toast! My favorite quick meal is overnight oats (less than 10 minutes to make the night before). I Follow Bob's Red Mill on Twitter as freefragments. I follow Bobs on facebook and twitter. Oh friend- these look spectacular!!!! You know, rather than winning this giveaway I just want to come eat these with you over some coffee and fun girl chat. MISS YOU!!!! Oh yum!!! My fav quick meal right now is smoothies! love BRM products! my favorite quick meal is a slice of homemade whole grain bread and some kind of nut butter. Love BRM products. I use them every week for some sort of fun project! And yeah, you may have just convinced me to finally use my gift card to Bob's! Ha!